Shipping Cost (Via DHL or UPS or FedEx Courier Co.): US $69 Only. Shipping Time : 1 To 2 Working Days Only. Shipping Cost is SAME For Country: USA, CANADA, UK, MEXICO, FRANCE, ITALY, GERMANY, SPAIN, SWEDEN, DENMARK, SWITZERLAND, NETHERLANDS, MALAYSIA, BELGIUM, CHINA, TAIWAN, SINGAPORE, HONG-KONG, SOUTH KOREA. Safri/Portable/Traveler harmoniums fold up into a suitcase-like box ½ to 2/3 of their regular height. There is a handle in front so that they can be carried with one hand like a suitcase. 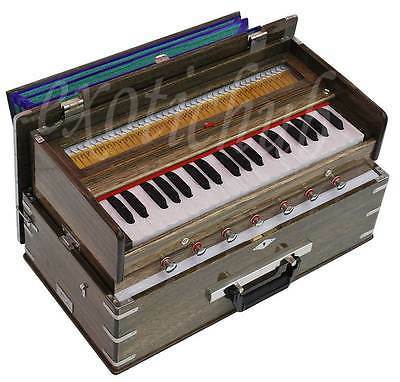 If you are traveling around a lot with your instrument this is an attractive option, since it’s lot easier to carry a harmonium this way than by the two side handles of a regular harmonium. In general, you sacrifice no sound by getting a portable one. Harmonium is in the family of free-reed aerophones and resemble small, tabletop size organs. Each harmonium has a bellow at the back that is pumped by one hand while the other hand plays the keyboard. Inside they contain multiple chambers. There are different banks of free reeds in each chamber. The size and shape of each reed in the bank determines its pitch. Engaging Stops directs the airflow to various chambers. Each playing Key and each Drone controls the air through one or multiple reeds within a chamber. When engaged, Drones provide a continual harmony note and are played in unison with the keyboard. 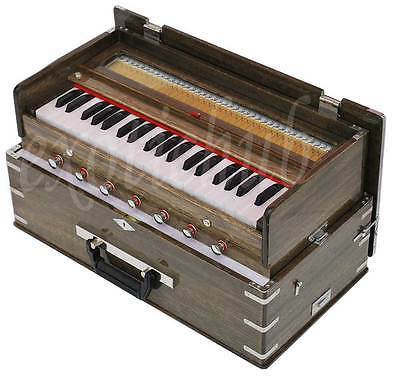 There are two main types of harmonium: a foot-pumped version that resembles a small organ, and a hand-pumped portable version that folds up for easy transport. This is a hand-pumed version. Harmoniums give an amazing amount of good sound and music, even for the beginner with little skill or experience. Their mellow, warm-sounding tone blends well with the human voice; thus they are especially well-suited for individual or group singing. Note: Colour of Harmonium & craft work may be slightly different from the displayed images. Scratch mark, small dent may appear on it at the time of shipping. TRAVELER (SAFRI) HARMONIUM CLOSED: 55.5 CM. x 30 CM. x 28 CM. (SAFRI) HARMONIUM OPEN: 55.5 CM. x 32 CM x 32 CM. The weight is approximate. Because this is a handmade product, weight can fluctuate up to 1 KG. to 2 KG. Guaranteed Hand Made Product Of India. Custom duties/Taxes Not Applicable if the shipping address is a non-commercial premises in USA only. We may ship item as a Sample/Personal use/commercial (big order/bulk purchase) for transit formalities. Shipping Insurance is free by DHL or UPS or FedEx. Insurance only cover the Main musical Instrument – Physical damage only. Insurance Not applicable for Any instrument Case or Box. Customer must report damages to DHL or UPS or FedEx with in 24 hour of the receipt of item. You can also report the same to us at our email address: exotichub at gmail.com by giving the details of the defect and photographs for fast/quick response. We will make sure that issue will be resolved as early as possible. We do not promote return of the product due to very high cost of shipping. However, if you wish to return an item, we are ready to refund your 60% cost of item only. You will also have to bear the cost of sending the item back to us. Please contact us about any questions that you might have before bidding. You can also contact us at any time to enquire the status of your order.